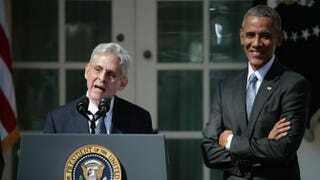 Judge Merrick B. Garland speaks after being nominated to the U.S. Supreme Court as President Barack Obama looks on in the Rose Garden at the White House on March 16, 2016. We’ve been with President Barack Obama since the beginning. As three of his senior advisers, we worked closely with the president on a host of important issues—few more important than assisting him with the judicial nominations and confirmations of Justice Sonia Sotomayor and Justice Elena Kagan. Nominations are not taken lightly, and they can’t be, for too much is at stake for the American people. Justice Antonin Scalia’s passing has again brought to the forefront the important decision of whom to nominate—and confirm—to our nation’s highest court. The relevance of this decision is keenly understood by the African-American community, since many of our struggles for freedom, justice and equality, including the right to vote and access to an equal education, have been fought for in the federal courts—and ultimately won in the Supreme Court. In the face of obstruction, President Obama has sought to fulfill his constitutional duty to nominate a qualified candidate to serve. As he has so many times before, he has taken this responsibility seriously, and carried out his duty as president, by nominating Merrick Garland. For this reason, we should stand alongside the president and demand that the Senate vote on Judge Merrick Garland’s nomination. We ignore this issue at our peril. We know Chief Judge Garland very well. We have worked for him, and with him, to uphold the Constitution and to do what is right for the American people. Garland has been a judge on the U.S. Court of Appeals for the D.C. Circuit since 1997. Having earned degrees from Harvard College and Harvard Law, along with two clerkships and significant stints in federal government under two separate administrations, Judge Garland is an eminently qualified candidate for the Supreme Court. But more than his pedigree, it’s his fairness that makes him the perfect man for the job. In a period of extreme obstruction and polarizing politics, we need a fair and responsible voice on the Supreme Court more than ever. The Supreme Court is called to decide cases involving numerous issues of great importance to our communities, including affirmative action and voting rights. Given the predicted Supreme Court docket in the months and years to come, the obstructionism we’re witnessing is more harmful than ever. We need a fully functioning court, with nine justices hearing and deciding cases. President Obama has met resistance and obstruction since taking office in 2008, and we’ve been by his side from day one. We were there when his citizenship—and thus his eligibility to serve as president—was questioned. We were there when conservatives caused the federal government to shut down, vowed to block the Affordable Care Act and delayed the confirmation hearing for Attorney General Loretta Lynch. And we were there when they tried to block or delay President Obama’s nominations to federal courts, including Justices Sotomayor and Kagan. But we got it done, and we will be there with President Obama to get it done again. We have seen leaders use their gavel and perch to move us backward on voting rights, on civil rights, on the basic tenets of freedom. We will not let them stop President Obama from fulfilling his constitutional duty to keep the Supreme Court at full berth. Not today. Not ever. In the face of obstruction and disrespect over the past eight years, President Obama has worked diligently to do what is right for the American people. Now let’s roll up our sleeves and help him. Our nation deserves nothing less. Eric H. Holder Jr. served as attorney general of the United States from February 2009 to April 2015. He is currently a partner at Covington & Burling LLP. Melody C. Barnes served as director of the White House Domestic Policy Council from January 2009 to January 2012. She is co-founder and principal of MBSquared Solutions LLC. Tony West served in the Obama administration from April 2009 to September 2014, first as assistant attorney general of the Department of Justice’s Civil Division, then as associate attorney general of the United States, the department’s third-ranking official. He now works as in-house corporate counsel in New York.